I'm nearly finished the "pay it forward" challenge pieces, which I cannot post because I want to surprise the three recipients. June was my target for mailing these, but life happens. We were away for a week, had a wedding and a few other events, the biggest one being that our granddaugter, who has been living with us for the past two years, departed for South Korea to teach English. She did most of this herself, but the preparations included shopping trips (she does not drive), last minute "I forgot..." stuff, and a lot of emotions. Anyway, I wanted to post something, so this is a paper-pieced Christmas wreath, about 20' square, from a pattern in an old magazine. I made about eight of them for gifts and as samples for a class that I taught. They were in several color combinations, from traditional to this, and even one in pale blues and silver lame. Most had beads or some type of embellishment. Quick and easy. Last night someone asked me how to quilt a project she was making. 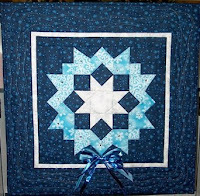 She had purchased some Nativity panels and was making "cheater quilts" for Christmas gifts. She said the four recipients loved to decorate their homes at Christmas time and "have everything" so she hoped this would be a good gift. I had to admire her for thinking this far ahead. I'm usually making Christmas gifts the first week of December! LOL, I'm usually making Christmas gifts a few days before the 25th!! I'm also one to leave Christmas projects to the last minute, so I'm impressed that you are making this so early in the year! What a nice gift to give, too.